As part of one of my units at college I'm doing a short video for my clients website. 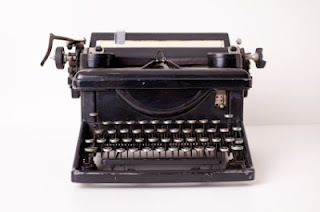 I'm still desperately needing some 1920's props, like the typewriter above as its integral to the story. Here is my treatment on the film 'Terminology' as I have called it. The video is a spoof on Murder She Wrote. Showing Helen Evans copywriting extraordinaire, styled like Angela Lansberry at her typewriter in the Murder She Wrote introduction. The motion picture starts off in black and white to emphasise words, selling copywriting services. The character Helen Evans is introduced working in a 1920’s-1950’s office typing on a typewriter. Helen is typing a series of old marketing terms that don’t work in today’s market but are still frequently used, think no1, market leading. Camera focuses on the paper that’s pulled out of the typewriter and shows the bad copywriting terms that have been used, a scream is heard. The film then changes to full Technicolor, think Wizard of Oz, showing Helen at a PC as the Murder She Wrote Introduction theme tune begins to play. The camera pans from left to right showing Helen at a laptop, then at her I-pad, then at a whiteboard teaching a class, and then again at the I-pad when the Murder she wrote theme tune fades out and camera zooms in on Helen and she begins to address the viewer. Helen discusses the benefits of copywriting and gives tips and hints that may be useful. Powered by a dual-core Intel engine. Up to five times the speed of the PowerBook G4. Eight times the graphics bandwidth. With built-in iSight for instant video conferencing on the move. Front Row with Apple Remote to dazzle everyone in the room. Now available in 15- and 17-inch models starting at just $1999. Then the camera focuses back on Helen and she asks if you still can’t write copy maybe you should hire her, the professional. Let me know your thoughts on the treatment, and if you can help me out with any kind of typewriter I would be forever in your dept!